My little bakery 🌹: 5000 Facebook Fun Giveway! I am so grateful to all of you, guys! Many of you know, that I am newbie and am still learning many things. when suddenly stumbled upon Pam's blog. spread the Word of God in my native Ukraine. I was amazed by the beauty of her work! Then there were a lot of discoveries! new names of supplies and products. All these girls were and still are my teachers. I am very thankful to them for sharing their skills with us! I started my FB page back in April 28, 2011. Only 9 months ago, I even could not think that I will have 5000 wonderful friends! and I want to do this giveaway for all of you! I have some awesome venders who have offered some goodies you are going to "LOVE"! These gifts were kindly provided by Karen and Mike from http://www.karenscookies.net/. I love their site and service and always recommend them to my friends around the world! 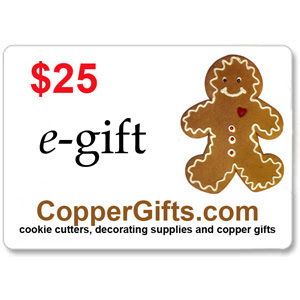 CopperGifts.com offered $25 gift certificate to help us celebrate. you have to register and create a new account to get this gift card. Many thanks to Beth and Ray! Yes! These wonder-cutters from http://www.ecrandal.com/ are also the part of the giveaway! You will love them! I fell in love at first sight! Wendy from Green Beansie give 50$ certificate for the purchase of wonderful printables! Thank you, Wendy! I love your printables! 1 dozen of lace hearts cookies! You have 6 chances to win this giveaway, but you must leave a separate comment on this blog post for each entry to count! 1. Become a fan of My little bakery on Facebook. And leave a comment here letting me know you are a fan. 2. Follow my blog. And leave a comment letting me know that you do. 3. Become a fan of KarenCookies on Facebook and tell them Thank You for being a part of My little bakerys' Giveaway. 4. Become a fan of CopperGifts.com on Facebook. And leave a comment letting me know what cookie cutter you want the most! 5. Become a fan ecrandal handmade copper cookie cutters on Facebook. And let me know what cookie cutter you want the most! 6. Become a fan of Green Beansie on Facebook. And leave a comment letting me know you do. If the winner is from a foreign country, he will have to pay for shipping. Good luck and thank you all so much for your support! I truly appreciate each "like" and every comment you leave! The giveaway is done and I can announce the winner! The lucky number is #194. Congratulations to Oihana Subiza from Spain! I'm a fan of Karen's cookies too! I love the little packet of seasonal sprinkles they put. In every box! I've been a fan of copper cutters and a customer too! I NEED the new 2.75 and 1.5 inch fancy square cutters! Huge ecrandal fan!! I love some new Easter cutters, especially the marshmallow peep! i am a fan of my little bakery on facebook! Yo ya soy fan de todas las paginas. Gracias por el sorteo. I'm a fan of ALL the pages! Good luck everyone!! I love my lil bakery on FB! I'm a huge fan on Facebook! I am already a fan of My Little Bakery and have been for some time....you're so awesome!! I'm a new fan of Green Beansie on FB! I follow ecrandal on FB and would LOVE a Paisley cutter! I am already a fan of Karen's Cookies and I went and left a thank you there! I am a fan of KarenCookies!! I am a fan of My Little Bakery on FB!! I follow CopperGifts on FB and would like the Mini Fancy Square COOKIE Cutter! Thanks for opeining this Giveaway to international fans! I am a fan of CopperGifts.com on Facebook and i would like the round kind..not the bird. I have been a delighted and amazed fan of My Little Bakery on Facebook for awhile. You make my eyes go so wide that my eyeballs pop out of my head! haha! Please include me in your Giveaway. Already a fan of ecrandal handmade copper cookie cutters and I would love to have a fan ornate large cookie cutter....I just love it! I thanked them for their contribution o your giveaway! I am a FB fan of copper gifts.com, and I would love their Lovebird cookie cutter!! I follow your Blog and subscribe to you by email! Congratulations on the 5000! I am a fan of My little bakery on Facebook. I am a fan of My Little bakery and have been for awhile... I love you site! You are so talented. I love the birdcage from ecrandal and the dress cookie cutters... But I love your decorated cookies even better.. I am such a huge fan of My Little Bakery on FB!!! Nadia....thanks so much for your sweet mention of CookieCrazie. I'm honored that my ministry to UA is what drew you to cookie decorating. You have developed into such a FABULOUS decorator in such short time. I'm so happy for you. Congratulations on the 5000 FB fans. You have WAY MORE fans that CookieCrazie does. And you should. You're incredible! I'm already a fan of Coppergifts on FB and I thank them for their contribution to this giveaway. I'd love to have their oval fancy plaque cookie cutter! I am a fan of Karens Cookies on FB!!! I'm already a fan of Karen's Cookies. I am a fan of Coppergifts on FB and would love the oval fancy plaque cutter!!! I am now a fan of KarensCookies on Facebook! Thanks for the reccommendation! I left a "Hello" on her Wall. I am already a fan of Copper Gifts and would LOVE to have their 4" Fancy Square cutter. I am a fan ecrandal handmade copper cookie cutters on Facebook and I want their 6940 EMMA PARTY DRESS cookie cutter the most! I'm already a fan of Ecrandal and would love any cutter on their site. They have the most fabulous assortment! I am a fan of encrandal handmade copper cookie cutters on FB!!! I would love their paisley cutter! I am a fan of Green Beansie on FB!!! I already a fan of Copper Cutters and If chosen, I think the Diamond Ring ...after all, one can never have enough Diamonds!!! I am now a fan of CopperGifts.com on facebook. They have over 2000 Cookie Cutters! I have to tell you that it is difficult for me to choose only one to mention! One set that I like is the Flowers and Leaves set, I would not mind owning that set along with about 2000 others! haha. I am a fan of all the pages and I follow your blog :) I left a message for KarensCookies thanking them for being a part of the giveaway. I would love the bird cookie cutter from Copper Gifts and any of the horse cutters from Ecrandal homemade copper cookie cutters. I am following your blog "My little bakery". I visited Karen' and Thanked her for being part of your Giveaway!!!!!!!!! I visited Green Beansie~~Love the Landscape pictures and am her Newest Fan. I'm already a fan of your page on Facebook! Congratulations on 5,000 fans, your work is lovely! I am now a fan of ecrandal of facebook. This is another place with lots of choices..I will pick the large kitten cutter as my choice. I am a fan of GreenBeansie on Facebook. I am a fan of Karenscookies on Facebook. I am a fan of ecrandal handmade copper cookie cutters on Facbook and would love the lipstick cookie cutter. I have been a long time fan of your facebook page.. so, check! Karen and Mike have a new fan and customer thanks to you, Nadia! I've always followed your facebook, but now I am following your blog! Congratulations on 5,000 fans! You deserve way more and you are on your way to getting them! I am a fan of Green Beansie on Facebook. I am a fan of Green Beansie. I'm already a fan of Karen's cookies. She's taught me so much about the art of cookie decorating. Love your blog since I am also a newbie! I am so following this beautiful blog!!! I am a fan of Karen's Cookies on Facebook!! Thank you for the recommendation! I am a FB Fan and customer of CopperGifts.com new order placed today...thank you for sending me there!! I am a fan of my little bakery on FB. 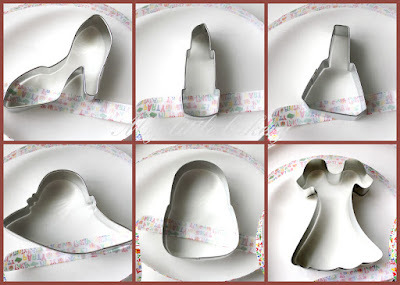 I am a Fan of ecrandal handmade copper cookie cutters on Facebook and I love Sunbonnet Sue!! She is adorable!! I am a fan of Green Beansie on Facebook and can't wait to hit her Etsy shop!! I'm a fan of Karen's Cookies on FB. I'm a fan of coppergifts.com on FB. I'd love the fancy rectangle cookie cutter! I"m a fan of green beansie on FB. Copper gifts has a new fan a customer! My income taxes are flying right out the window with all these great new stores you introducing me to! I already follow your blog - love your cookies! I'm a fan ecrandal handmade copper cookie cutters on Facebook and I'd like any cutter that has to do with what boys like. I've got my third grandson coming in May. This would be for the question before too. Already a fan of Karen's Cookies - posted a Thank You! You are a true cookie artist, for sure! Such fun designs and ideas - creative! Amazing lace work! I just liked CopperGifts.com on FB. I like My little bakery on FB! I'm a fan of everyone and I love your cookies! 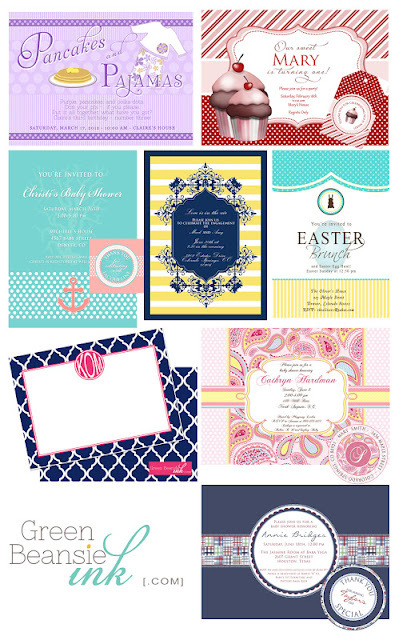 I'd love a scroll cutter from e-crandal and a fun Easter cutter from Karen's! Came across your blog first time & read about this giveaway via Haniela's Facebook post. And DEFINITELY your follower now on. Your work is amazing, Nadia. I want the Fancy Rectangle Cookie Cutter 3.5 inch!!! I ALREADY follow you on FB as Sugar and Stitches! I'm a fan on Facebook!!! I ALREADY follow Karen's Cookies on FB as Sugar and Stitches. I ALREADY follow Copper gifts on FB as Sugar and Stitches. I have become a fan of your Facebook page. Was just looking through the albums, my goodness, how intricate work done on small cookies. You are sooo talented!! I'm a subscriber to your bog via email. I liked Karen's Cookies on FB and thanked her. I liked Coppergifts on FB and thanked them. I liked ecrandal on FB and thanked them. I am your fan on facebook, and love your work! I'm already a fan of your facebook page and of your gorgeous cookies!! I am a very big fan of ecrandal on facebook, I love the birdie cookie cutter that you are giving away! I am a fan of Coppergifts on facebook and I would love the fancy square cookie cutter! I follow your awesome Blog! I liked Green Beansie on FB and thanked them. I'm a fan of My Little Bakery on fb. I'm a fan of Green Beansie on fb. I'm a fan of Copper Gifts on fb. I've been wanting the Diploma (Scroll) Cookie Cutter - Item: 1538. I now follow ecrandal handmade copper cookie cutters as Sugar and Stitches. I am a fan, your cookies are amazing!!! I am a fan of MyLittleBakery FB page. I am amazed by your work, and I can't believe you have only been doing it a little while! I am also a fan of Karen's Cookies. I am a fan of ecrandal handmade copper cookie cutters, and I would love to have that sweet little bird cutter! I am a fan of everyone and follow your blog - you have an exceptional talent!! I am a fan of Karen's Cookies on Facebook. I am a fan of Copper Gifts on Facebook. I am a fan of Ecrandal on Facebook. I am a fan of Green Beansie Cards on facebook. I'm a fan of Karen's cookies on fb! Just liked coppergifts.com. I'd love to get the owl cutter! Doing an owl themed party for my baby girl's first BDay. Newest fan of ecrandal handmade copper cookie cutters on FB. LOVE the bird cutters. So cute! I am a fan! Thanks for sharing your ideas! I am fan...wonderFUL blog!! Thanks for making this give-a-way possible! You're the best, I enjoy reading your blog every morning and see your beautiful cookies. I would love to participate because I am a fan, super fan. I follow you by email. Love your blog and your work! WOW WOW WOW...I just love what you are doing to cookies :-))) I am your biggest fan from Serbia! I´m a fan on FB and also following your Blog. You are gorgeous and so inspiring! Я Ира, и я просто в восторге! Как все у тебя здорово и классно! Поздравляяяяяю))) 5000 дррррузей!!! Siento no hablar ingles. Me encantan tus trabajos. Hace tiempo que los sigo y los admiro mucho. Me encantaria probar tus galletas. Saludos desde España. Sorry I can not speak English. I love your work. I have long admired and much. I would love to try your cookies. Greetings from Spain.